These smaller size, two-sided panels place materials at child-level without blocking teacher's view. Use them as single panels or combine them in a variety of configurations. 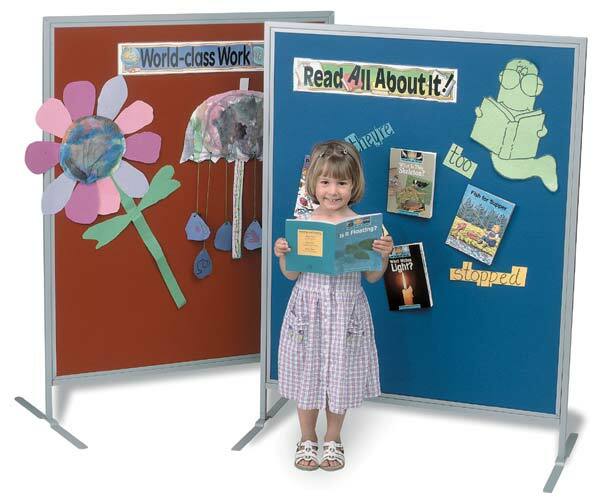 Panels are easy to set-up and store, and they make great portable display bulletin boards! The vinyl tack board offers a rich-looking, textured surface for attaching lightweight items with thumbtacks, push-pins, or staples. The looped fabric surfaces are available in a variety of colors. They accept hook-textured backing for attaching items. For extra safety, each panel includes a set of support feet with a snap-lock button for added stability. They're constructed with sturdy steel frames.